Firefox provides excellent support to HTML5 overall. As to the medial elements, Mozilla Firefox (3.5 and later) supports HTML5 video and audio tags and HTML5 native media formats Theora video and Vorbis audio in an Ogg container, Firefox 4 also supports WebM format. The WebM format is based on a restricted version of the Matroska container format. It always uses the VP8 video codec and the Vorbis audio codec. HTML5 introduces built-in media support via the < audio > and < video > elements, offering the ability to easily embed media into HTML documents. See a live demo of Firefox HTML5 video here. If you like to convert Firefox HTML5 videos, we strongly recommend HTML 5 video player. It can not only generate Firefox HTML5 video format WebM and OGG, but also another HTML 5 native video type MP4/ MPEG H.264. Although this HTML5 video will not work on Firefox, as both Firefox and Opera do not support the MP4/ MPEG H.264 format. You will still need it because MP4/ MPEG H.264 is supported by Internet Explorer and Safari. Firefox HTML5 Video Made easy – 3 easy steps! 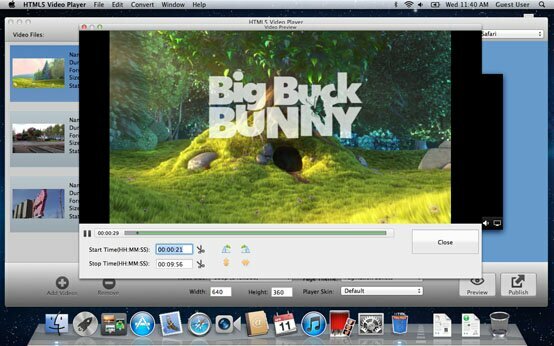 You can simply drag and drop your source videos to the video player and converter. Or you can go to the Edit menu >> Add Videos to browse through your video albums on your computer and select to add them to the HTML5 video software. Once you are ready with tuning the html5 video player, click the Publish button to generate your HTML 5 video gallery. It will be saved in the Output Folder of the video tool on your hard disk. Go to the HTML5 menu, then choose Open Output Folder from the drop-down menu list. Now you are ready to publish your HTML5 videos that are compatible with Firefox, IE, Chrome and many other web browsers to your live website.